Google is planning to invest $1 billion to expand its data center estate in Council Bluffs, Iowa. According to Des Moines Register, the money will be spent on a new, four-story data center building that will support its cloud-based products such as YouTube, and provide around 70 local jobs. “This expansion in Iowa is part of the gradual process of growing capacity for the future and will allow Google to better serve its users around the world,” said the company in a statement. Additional funds bring Google’s total investment in the Council Bluffs campus to $2.5 billion – making it one of the largest economic development projects in the state. Iowa also hosts large server farms owned by Facebook and Microsoft. Google moved into Council Bluffs way back in 2007, and currently employs around 300 staff there. On Friday, local government approved plans to expand the campus, which will cost the company $1 billion dollars by 2019. Iowa makes an attractive location for data centers thanks to cheap land, a low natural disaster risk and access to renewable wind energy. The state has been trying to create additional incentives in the shape of considerable tax breaks – Google only confirmed its latest investment after securing $19.8 million in sales and use-tax refund, bringing the total state sponsorship of the Council Bluffs campus to $36.6 million. Microsoft is currently building its second data center in Iowa, at the cost of $1.2 billion. 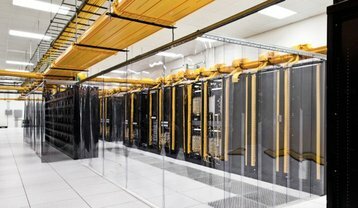 Codenamed ‘Alluvion’, the facility in West Des Moines will power its Azure public cloud service. Meanwhile Facebook has recently opened the first phase of its modular, air-cooled data center in nearby Altoona – its first to be powered by 100 percent renewable energy. The social network has already started building the second phase of the facility, expected to complete by the end of 2015. Both companies have received considerable tax breaks from the Iowa state government. “When you have places with the brand names like Microsoft, Google and Facebook basically saying, ‘We’re going to grow in Iowa, and Iowa is our preferred state to do that,’ there’s a certain amount of national, international recognition that causes people to say, ‘We need to look at Iowa through a different lens,’” Debi Durham, director of the Iowa Economic Development Authority, told Des Moines Register. Last week, Missouri Governor Jay Nixon signed a state senate bill that will provide similar tax incentives for new and existing facilities in the neighboring state.